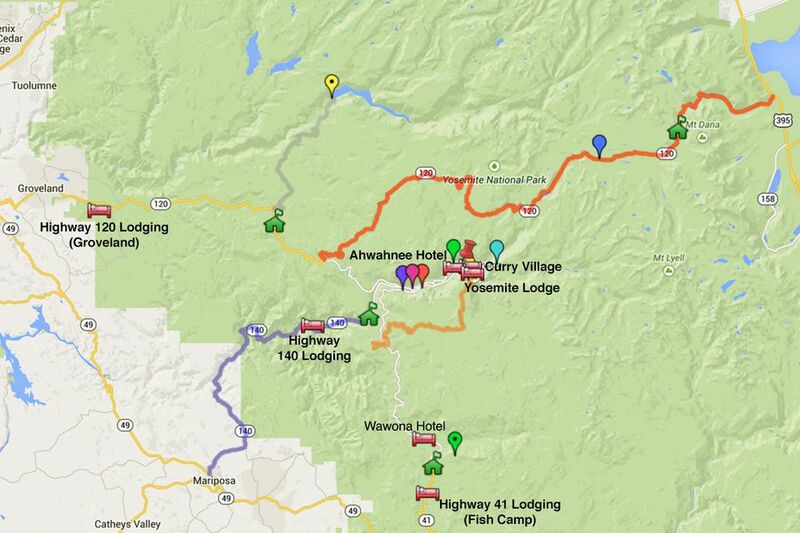 This Yosemite map gives an overview of the Yosemite area, to help you decide where to stay. These are the general areas where you can find a hotel or campground that are close enough to the park. Instead of spending all day getting there, you can now put on your hiking shoes and begin your outdoor adventure in no time. 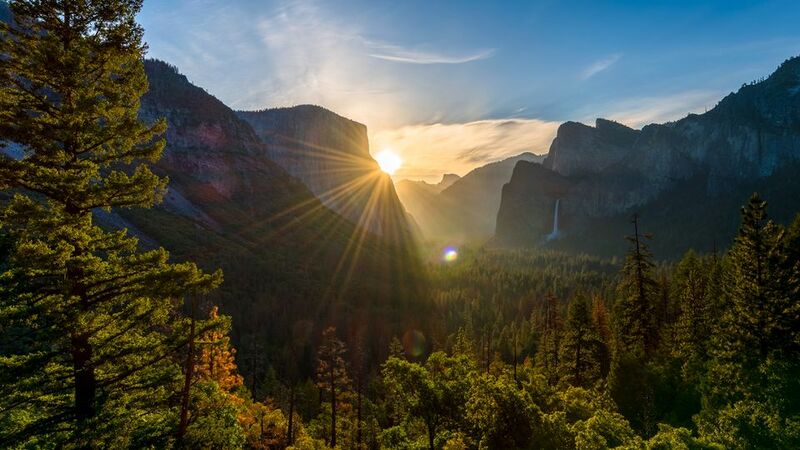 Find a place to stay, regardless of whether you're planning on hiking Half Dome, camping at the National Park, or visiting with giant sequoias. Stay up to date on park news, road closures, and more by viewing the National Park Service site for Yosemite. Although it's easy to Google a hotel near so and so, all the necessary information to make a proper decision is often left out. Discovering the perfect place to stay in the 1,200 square miles that make up Yosemite National Park has never been easier. If you want to open your door and step right onto Yosemite grounds, consider these locations. All of them are inside the park boundaries and come in a variety of styles. You might be surprised to find some vacation rentals and B&Bs inside the park, too. Whether you want a full kitchen for your big family getaway or something more simple, you can find it here. Fish Camp is very close to Yosemite's south entrance, Wawona and the Mariposa Grove of giant sequoias. It is still about an hour's drive from the valley. Although it's further away from the park, you'll have the luxury of access to grocery stores, restaurants, and movie theaters. Some popular options include bed and breakfast inns, vacation rentals, and camping sites. For most visitors, this is the best place to stay outside the park. But if you can't get by without WiFi, you may want to try Fish Camp or Groveland instead. El Portal is about 40 minutes from the Yosemite Valley, and one advantage of staying here is that you can use the YARTS bus system to get to the Valley. The route from El Portal and Midpines to Yosemite is scenic. You may even want to stop along the way to Yosemite for a selfie or two with a beautiful California backdrop. On CA 120 and 40 miles from the valley, Groveland is where visitors coming from San Francisco often stay. A one-hour drive from Yosemite Valley, Groveland is a small but charming place, with several historic hotels and a few restaurants. Groveland is also a good place to try if you like to stay in bed and breakfast inns. If you're traveling with your four-legged friend, Groveland is also your destination for a pet-friendly hotel. On CA 120 east of the Sierras and close to Mono Lake, this location is cut off from the park during the winter when the Tioga Pass is closed. It's also a two-hour drive from Yosemite Valley and is probably best-suited as a stop on the way to or from Yosemite. Renting a Yosemite cabin is a popular way to enjoy the park. Cabin options include housekeeping camps and privately-owned Yosemite cabin options. If you plan to rent a Yosemite cabin, plan ahead. Rentals fill up fast. Consult this Yosemite map to get a better idea of where each of these areas is with respect to Yosemite and the Valley. Redwoods in Yosemite Cabin: Located near Wawona (Big Trees Lodge) on the south side of Yosemite, they offer vacation home/Yosemite cabin rentals year round and have some pet-friendly cabins that allow up to 2 pets (for an extra daily fee). Yosemite Vacation Homes: Yosemite cabins inside the national park at Yosemite West. Yosemite Cabins - Inside the Park: Located inside the park, these Yosemite cabin accommodations are only a 15-minute drive or 8 miles from the valley. Pine Mountain Lake Yosemite Cabin Rentals: Rent a condo, house or Yosemite cabin in a gated community a few miles outside the park. Sunset Inn: Three quaint Yosemite cabin rentals. Yosemite Pines: It's an RV resort, but they also have cabins and yurts for rent. For a uniquely fun stay, rent one of their Conestoga covered wagon replicas, as the pioneers used, but with all the luxury amenities, so you don't feel like you've trekked across the country. Learn more about how to rent one here. Yosemite Bug: This rustic resort offers not only the hostel accommodations it's better known for, but also new private Yosemite cabin lodging with baths, bed and breakfast style private rooms with shared bath in the main lodge. They also have tent cabin options.